In news about white-people-getting-angry-because-they-won’t-google-Arabic-words news, white supremacists are organizing an anti-Muslim march on June 10. Carbonated News reports the Islamophobic marches are planned for several major cities across the country, including Orlando, Chicago, Dallas, and New York. Marches will take place in states such as California, Colorado, Florida, Illinois, Indiana, Kansas, Michigan, Minnesota, Missouri, New York, North Carolina, Pennsylvania, Texas, Virginia, and Washington. Anti-Fascist News is calling for counter-demonstrations against the bigots who were able to make a full flyer, but not look up the meaning of sharia. this reads like satire. obviously, there are plenty of reasons to be against this religious doctrine. the good does not outweigh the bad, here, imho. that’s my objective opinion, & no, it has nothing to do with “hate” or any silliness like that. 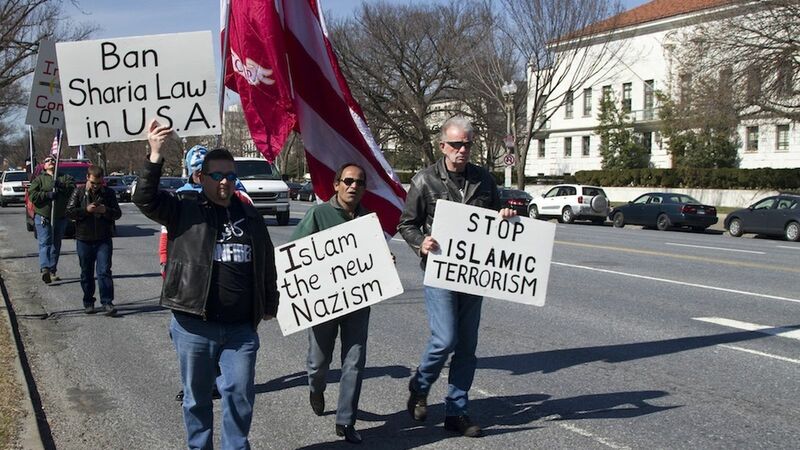 I simply disagree with some of the ideas espoused within sharia – & clearly, I’m not the only one. that being said, if you want to call someone a bigot simply because they disagree with an ideology, well… guess that’s that. nothing I can do about someone telling me that I’m a pineapple, or that the earth is flat, y’know? same concept. this article genuinely makes me sad. hard to believe people actually think like this, without realizing the irony of their blind intolerance all the while. Kuntil ! Pulang saja ke Indonesia! Ngapain hidup di Amerika ….we have Constitution you know???!!! Kalo ndak betah ya pulang kampung sono….